I first heard about the Steampunk genre several years ago, and though I can't remember my first introduction to it, I have found the Steampunk aesthetic fascinating. This portrayal of a past-that-never-was conjures up images of worn leather, top hats and monocles, victorian corsets and fans, aged brass buttons, and of course a really cool pair of aviation goggles. There's a certain sense of adventure that goes along with the Steampunk genre: along with its victorian sensibilities, it also depicts a future as H.G. Wells or Jules Verne would have envisioned it. Modern technology like computers are powered by steam, and pirates and explorers rule the skies in their zeppelin-like flying airships. I suppose it was only natural, therefore, that when I randomly saw "Steampunk Softies: Scientifically Minded Dolls From A Past That Never Was" on Amazon, I just had to go for it. I was immediately intrigued, and also surprised that I had never heard of this book before, considering all the craft blogs I follow (though I suppose it only came out in 2011). This little book is definitely a treasure. Steampunk Softies features patterns for 8 steampunk characters, each with their own intimidating list of materials. Before you even get started, however, the authors give you tips on cutting out the patterns, gluing, and aging fabrics, and also a reassurance that most of the detail pieces can be found in jewelry or hardware stores. Each character has a little introduction, complete with their name and back story. 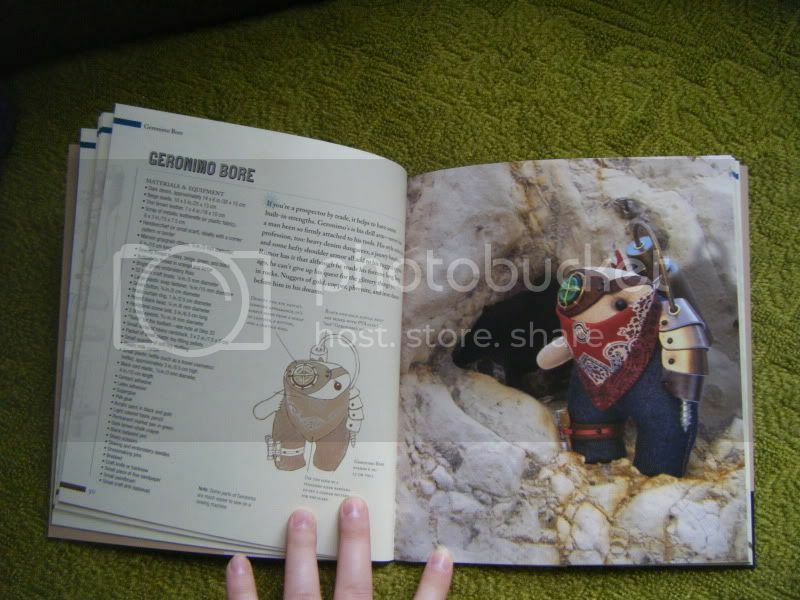 One of my favourites is Geronimo Bore, pictured above, a prospector with a drill attached directly to his arm and who just can't resist the "glittery things you find in rocks". Though his drill arm and eye patch look complicated, they're constructed with such simple things as a screw, a button, an O-ring and some embroidery floss. Another one of my favourites is Charity Storm, the dedicated aviatrix with her own set of wings. As with all the patterns, the list of materials is rather extensive (it takes up the whole left-hand column on the first page), but upon closer inspection, it's mostly stuff that most crafty types would have lying around anyway: a scrap of purple wool, a scrap of metallic lace, a couple of domed metal buttons... In addition, each step is illustrated, and a 360-degree view of each character is given. So despite everything, these softies are not as daunting a task to construct as it first appears. I have yet to make anything from this book, but I'm definitely excited to (yeah, yeah... grad school). 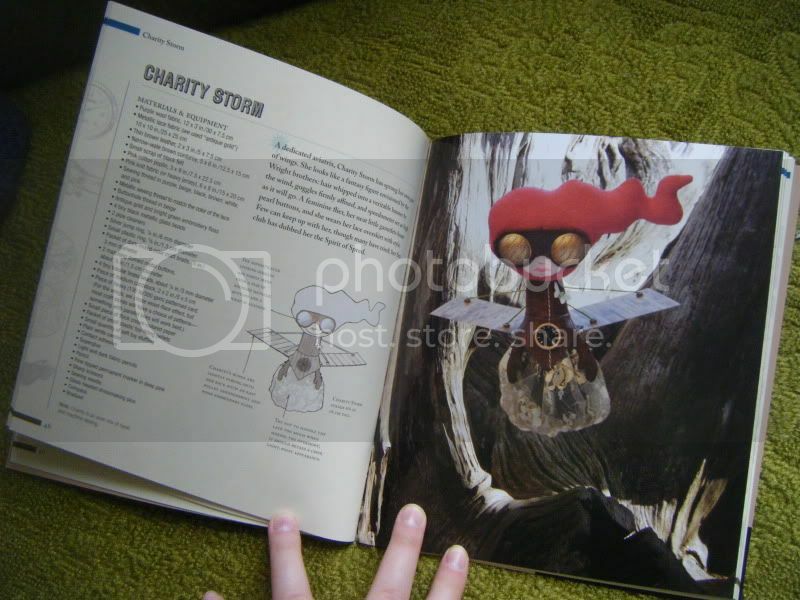 I'd probably start with the doctor Ferris Scapula (pictured on the cover in the top hat) because I think I already have most of the materials for him, but I'd love to make any one of these softies! 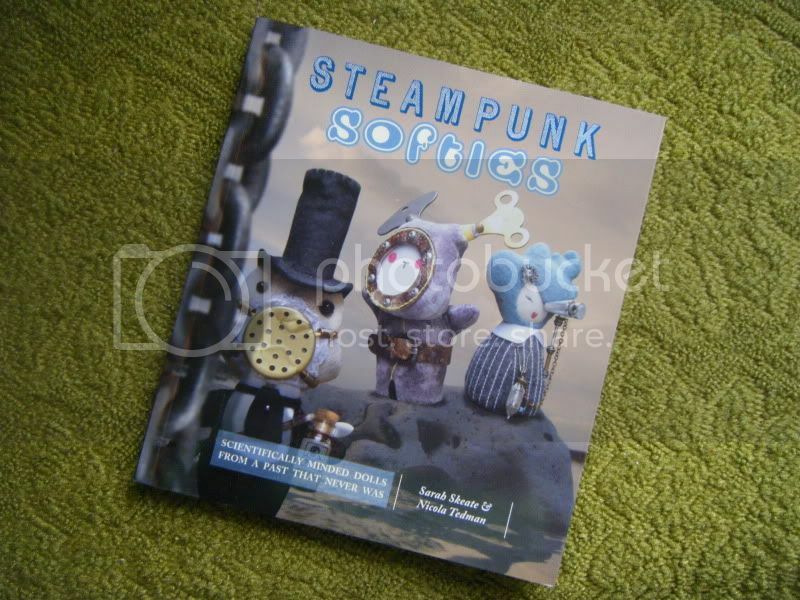 In all, Steampunk Softies is a lovely little book, and definitely a great source of inspiration.